So you have been shortlisted for the PTDF scholarship interview? Congratulations! But so has many other people from your state who will be competing for very limited spots with you so this post is meant to give you a glance of what to expect in the actual interview as well as to give you some tips on how to ace it. First of all, do not be tensed. The PTDF scholarship interview is more of an informal chat than a conventional interview. It usually takes between 5 and 10 minutes There is absolutely no need to be scared. You've got this! To answer this question you state how you came about your current research area and why you have decided to pursue this particular area. It could just be passion or it could be because it aligns with a past research project or maybe because of the bearing it has with your future professional goals. Unemployment or an opportunity to just travel out is not the answer to this question. Concisely explain how you quest for more knowledge and how your Bachelor's degree was not enough to quell your burning desire for more knowledge. Also, you might be asked why you can't gain such knowledge in Nigeria, explain why your chosen schools abroad would be more suited to your chosen research area. There is no one right answer to this question and it is one of the many questions in this interview whose answer is unique to everybody. A lot of introspection before the interview is necessary to get this question right. This answer to this questions is unique to everyone but just make sure whatever answer you give has some bearing with the mandate of the PTDF scholarship scheme which is aimed at developing indigenous human capacity and petroleum technology to meet the needs of the oil and gas industry in Nigeria. Please do not make the mistake of telling the PTDF scholarship panel that you do not intend to return to Nigeria after your postgraduate studies. That is enough grounds to disqualify you. Remember the PTDF scholarship scheme is aimed at developing indigenous human capacity and petroleum technology to meet the needs of the oil and gas industry in Nigeria. So as far the interview is concerned there should be no doubt in the mind of the PTDF scholarship panel that you intend coming back to Nigeria to impact the Oil and Gas sector. The answer you give to this question depends on your field of study and your area of research. It could be that you aim to proceed to a Ph.D. and eventually take up a career in research and teaching, do relay that to them. It could be that you plan to return and kick off a career in the Oil and Gas industry in Nigeria, you should also relay that to them. Tell them what your plans are after you finish your postgraduate studies but make sure your plans are in line with the mandate of the PTDF scholarship scheme. Here you can try to explain how your past has influenced your decision to proceed to get a master's degree. Unemployment or chance to go abroad are not good reasons and not what the PTDF scholarship panel are looking to hear. There is really no specific answer to this question for everybody as your answer depends on your own unique situation. Maybe you did some good research work in your undergraduate project and you are hoping to continue research in that area in graduate school. Or maybe you currently work in the Oil and Gas sector and that has given you some research ideas you hope to pursue in graduate school. Everyone's case is different. Do well to use this as an opportunity to sell yourself to the PTDF scholarship interview panel. Do not sell yourself short but do not lie. You could be caught and that would be the end of your PTDF scholarship dreams, there is no coming back from that. This is another situation that is unique to everybody so do well to state your academic and professional achievements that you consider exceptional and also state why you think they are exceptional. C. In the course of your career/academic experiences what contributions and/or impact have made? This is similar to the previous question and is self-explanatory. State what contributions and impact you have made so far in your professional or academic journey. Have you done some groundbreaking research in your field? Say so. Were you the Founder/President/Exco of a professional body related to your field? State so. These are just a few examples. The PTDF scholarship panel awards marks for comportment. Please try as much as possible to show confidence while speaking and answering interview questions. Even when you feel the interview is not going your way, do not fret. Speak audibly and dress neatly to the interview. Do not talk too much or you risk opening yourself up for more questions that you may not be able to answer. Be as polite as possible to the interviewers. The PTDF scholarship panel wants to know how your research proposal/Statement of Purpose relates to the Oil and Gas Industry and how the research you are pursuing would benefit the Oil and Gas industry and its expected impact on national development. It is not enough to tell them your proposed research would change the face of robotics and Artificial Intelligence as we know, but you also have to go ahead and explain to them how the Nation and the Oil and Gas industry will benefit from your proposed research. Yes! Do not go to the interview to sell wolf tickets--claiming to do things everyone knows you are not going to do. The PTDF scholarship interview panel is not stupid. Many of them are Professors and Industry experts and have enough experience and background knowledge to know when someone is bullshitting them. Some of them might ask you technical questions about your specific field. The question would usually be on concepts you were taught as an undergraduate or your final year project as an undergraduate while others in the PTDF scholarship panel would ask you questions from your statement of purpose. This part is pretty self-explanatory. The PTDF scholarship panel usually awards marks on basis of the class of degree you graduated with. Those with First class degrees earn the maximum 10 points while those with Second Class Upper and Second class lower degrees earn 8 and 5 points respectively. Do come with evidence of publication in any reputable journal or conference as it counts in your favour and it's an easy way to earn 5 marks. The PTDF scholarship panel usually prefers publication where you are the first author. Bring any award that shows you have been outstanding in any group whether professional, voluntary or academic. It goes without saying that the bar is raised a little higher for aspiring Ph.D. candidates. Below are some questions that you should prepare for. 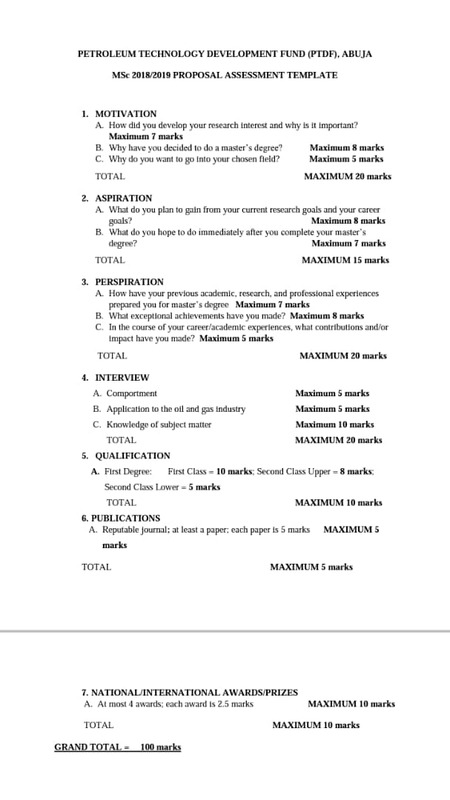 You will also be assessed in the Interview, Qualification, Publications, National/International awards/prizes in a format exactly like the Master's assessment template above. Hello Mr. Solomon, I want to confirm if an international award to bear a title, i.e JERUSALEM PILGRIM (JP), duly signed by the Mayor of Jerusalem and the Israeli minister of Tourism can be classified as a voluntary award and hence accepted by the interview (ptdf) panel. Kindly respond asap. Yes it can be accepted. But honestly, it is totally up to the PTDF scholarship interview panel to decide whether it would be accepted or not. That said, there is absolutely no harm in trying. Go along with the award to the PTDF scholarship interview and be ready to explain to them why they should accept it if they ask. Secondly, I want to confirm if an award issued for ones ability to climb mt. Saina, to pray and direct/lead others could be counted towards leadership/voluntary award and hence be accepted by the interview panel. Kindly respond asap! Yes, this can also be accepted. But honestly, it is totally up to the PTDF scholarship interview panel to decide whether it would be accepted or not. That said, there is absolutely no harm in trying. Go along with the award to the PTDF scholarship interview and be ready to explain to them why they should accept it if they ask. Good evening Mr Solomon, Please, do you know if there will be an aptitude test just like the recently conducted NDDC test in 2018. I don't think there will be an aptitude test. PTDF no longer does that. They now conduct interviews.